I’m just coming up to 20 weeks, which means I’m almost halfway through this pregnancy already! The past few months have flown by and I know the next few will do the same. Thomas and I have been savoring our time at home and taking advantage of my new found burst of energy (no more naps!). This time has been so special and every evening before bed, we talk about what life will be like with our tiny little best friend. There are no words to describe how incredibly excited we are. I’ve been journaling and trying to write down a lot of my thoughts throughout this pregnancy, as I want to remember all of the best bits and special thoughts that have gone through my mind. What are you both looking forward to most throughout the rest of the pregnancy? Julia– I’m quite anxious to already meet her! But I am looking forward to feeling her move (still waiting on that one!) and grow and develop even more. I’m excited to celebrate with all of our family and friends in May at my baby shower. Thomas– I’m really excited for the upcoming anatomy scan, I can’t wait to see what she looks like. What has been the most unexpected part of pregnancy to each of you so far? Julia– The first trimester was probably the most unexpected part. I really didn’t know that my morning sickness would kick me down that hard. It was tough to get through daily responsibilities with not feeling well 24/7, but I found that the more I got my mind off of it, the better I felt. The worst days were the ones where I just laid in bed, because it was all I would think about. I was actually grateful for our nonstop schedule to keep me busy. Now, the most unexpected part is how great I feel! I have so much energy and I find myself wanting to do anything around the house- bake (which is a new one for me), clean out and organize literally everything, prep the nursery and get the house ready for a baby. Thomas – How little control we have over it. Obviously, Julia and I make sure to practice healthy habits, but sometimes the best thing to do is take a break. I’ve also felt that I’m pretty powerless when it comes to helping out. Especially during the first trimester I was gung ho about solving Julia’s nausea issues. I made special teas, came up with experiments for daily activities and nothing seemed to help. I’m so used to helping address problems and then identify solutions that this was hard. In the past I’ve helped Julia out as much as possible, but I’ve learned that normally the best thing I can do is be supportive and understanding during the whole process. Do you have any favorite names picked out? Do the two of you like similar names, or has finding a shared favorite been a challenge? Julia– We do! But we are keeping it private. We’ve talked about names for years, and while this one never popped up until a few months ago, we can’t imagine anything else. We call her by her name every day and it makes her feel like a real person. Thomas – Yes we do and we both love the name. We call her by her name and it seems so fitting since she’s a little lady. What makes you the most excited about becoming parents? The most nervous? 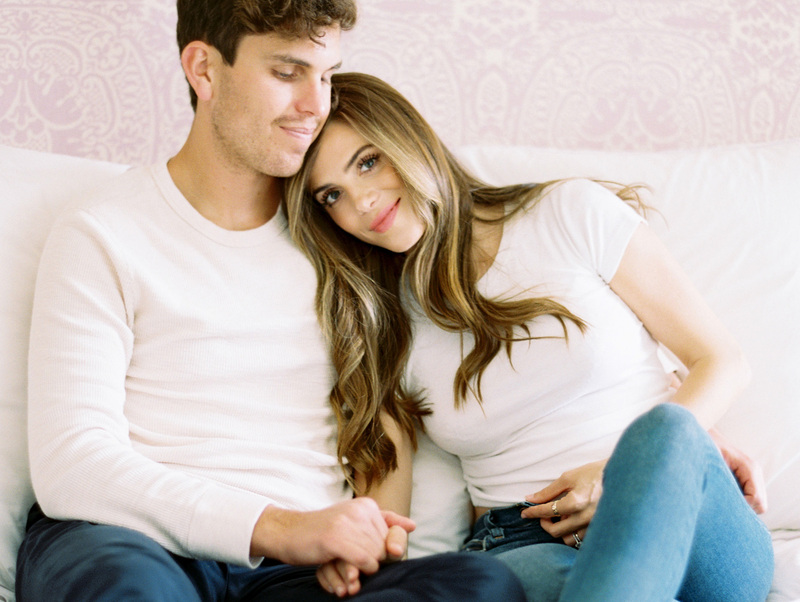 Julia– Thomas and I have been married for almost seven years (this August) and I’m really excited for this new chapter for both our family and our relationship. Our priorities have always been on each other, but I’m looking forward to having this new little person who we get to focus on. When we found out we were expecting, it really did put a whole new perspective on everything and we know where our priorities stand. I can’t wait for all of life’s little celebrations (holidays!) now that we have a little one who gets to experience them for the first time. I am most nervous about our schedule, particularly work and how we will balance everything. Thomas– I’m most excited about getting to witness and help facilitate her learning. I’m always fascinated by children and how curious they are and I can’t wait to be there every step of the way as she discovers the world. I’m most nervous about all of the things I don’t know about children or being a parent as of today. I know it’s something I’ll have to learn by doing, but we are often stopped in our tracks by questions that probably seem so easy for current parents. What are a few of the things you’re most looking forward to doing or sharing with baby B? Thomas – Seeing how excited Julia is to be a mom has me even more thrilled. I know that there will be lots of special moments. I can’t wait to read to her, to teach her math, to make food for her, to take her on walks, garden and do a million other things. Where are you headed for your babymoon? Julia– We are heading to Spain in May and we couldn’t be more excited. We are not traveling much this year, only for GMG Collection shoots, to NYC for work and a few other things (my sister’s bachelorette party in Miami and her wedding in Ireland). But this is our one trip for the two of us this year and it’s so crazy to think that it will be our last, before we become a family of three! Thomas – We are going to Spain and we plan on taking it pretty easy. It will be a special time because we are going to do our best to take a real vacation. It sounds especially nice because this is the first year in a long time that we’ve spent more time at home vs. traveling. Where do you hope to travel together during the first few years as a family of three? Julia– Her first trip will be back to California to see family for New Years. After that, we hope to take her to meet our friends that live around the US and beyond. We haven’t quite talked about where our first family trip will be, but I’m sure we will have many travels ahead of us. She’ll be the tiny little helper on all of our GMG shoots around the world! Thomas– I can’t even think that far ahead but my hope is that she’ll be our little travel companion. I’m sure Julia has already picked out a Baby Bjorn for me to carry her around in wherever we decide to go. Will anything change with the blog or Gal Meets Glam Collection as your family begins this new season of life? Julia– We are going to wait and see, but for the most part, the blog will remain the same. I feel comfortable with the amount of personal life we do share, which is not that much. I always want our choice of sharing something to be up to us, and not something we have to do. 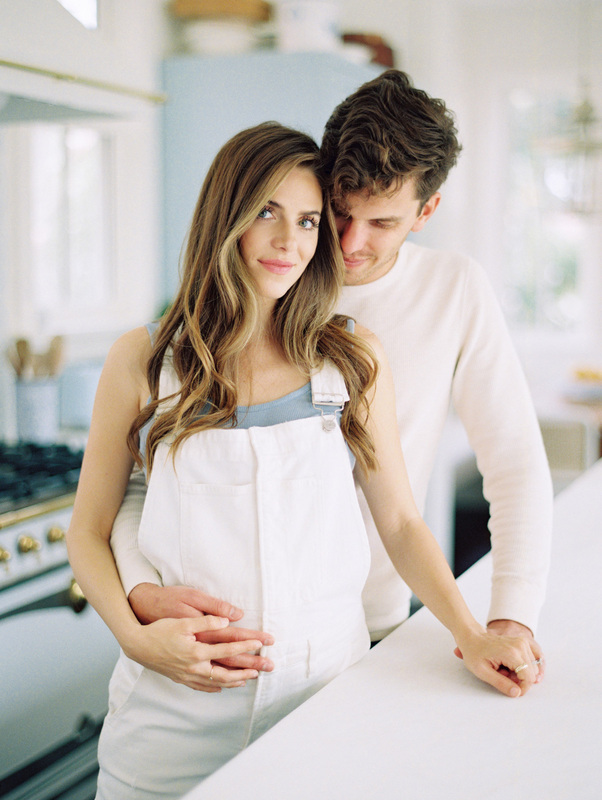 Thomas and I always knew that when it came to growing our family and raising kids, we wanted to keep that part of our life pretty private, as we currently do with our family time. I can only imagine how difficult it must be to deal with social media with kids, but I want to try our best to not have our phones constantly in her face, especially during such intimate private moments that we don’t need to share online. I hope I’m able to give her that respect and privacy, for herself, and us as a family. It’s so much fun to share online and connect with others, but more than anything, I want to be present for her the best I can. Thomas – I never say never, but at this point our plan is to keep some things private and share others. Even now we have a very fine line of what we decide to share and what we don’t share. While I know we will think our baby is cute and we will want to capture life moments, Julia and I both strongly believe that a phone or camera shouldn’t be constantly in the face of a child at any age. In fact, I’d love to capture more moments on our film cameras so that we don’t obsess over getting the perfect shots of her. So wonderful how you deal with the amazing situation! Eek, I’m so excited for you both! Congratulations again! So many cute photos, and a lovely post! Really loved reading your answers! I am so excited for you two (three)! Ah congratulations! I love how you open up and I wish you a lot of luck! OMG, I loved reading this Q&A! Everything about both of your answers were the sweetest! It actually made me emotional reading this! I’ve followed your blog for a number of years and am just so excited for the both of you! Thank you for sharing and congratulations again! I really respect your decision to keep your future child’s life relatively private. Of course I think your readers hope to see glimpse’s of motherhood and your family, but it’s great you two keep those private moments sacred! This is so sweet! Excited to follow along on your journey and thank you for letting us be a small part of it. I am so excited for you all! As a mother and grandmother I have learned that the most important thing is giving each child loving, consistent discipline and always following through with what you say. Trust your instincts as parents. Cuddle, snuggle, hug and love unabashedly, especially in the early formative years ( age birth to 5 years ). Treasure each stage and moment as they grow up in the blink of an eye. These photos are so beautiful and I really enjoyed reading this post! Totally respect your decision to keep a fair amount of things private but still hoping you share some sweet moments with the little lady here on the blog! So happy for you both! Thank you for sharing! So incredibly happy for you both! Everyone will be so thrilled with anything that you decide to share (and even if you don’t feel inclined to share anything at all that is 100% OK and your choice and I respect it so much):) Just know that your health and happiness (all three of you!) is all that your readers want and that is enough:):) You will be such a wonderful Mom and Thomas will be the best Dad!! What a blessing that you are feeling great! Such a sweet post, and o refreshing to read your views on privacy and respect for your little one. Too many children (especially little girls) are growing up in front of their parent’s cell phone. Not good for a healthy childhood! Can’t wait to see your baby’s name <3 :) I know she's going to be beautiful! Really enjoyed reading this post! This will be an amazing new life and I have got the feeling that you will be great parents! This post made me so happy! I feel the same about phones as you both do. I hope that when our little joy comes we capture most of their moments on camera and not the iPhone. I know there will be many moments on the phone as it’s always in our pocket and available (like video of their first swing set adventure etc..) but I feel like kids know what a phone is from way too young and know how to use it and rely on it too early in life. Parenting is such a unique and personal journey and I’m sure you will both be naturals! Can’t wait to see where this journey takes you both. Congratulations again!!! This is so sweet. You’re going to be amazing parents! Much good luck and love to the 3 of you! Oh, and I can’t wait to find out her name! You guys are so sweet. I hate to break it to you, but the next 20 weeks will not go so fast. And I think most moms can agree that the last month feels like forever! Hahaha Thank you for sharing. You look absolutely beautiful. I am so excited for the two of you! You both have so much to offer your daughter. Your creativity, love of nature and travel are amazing gifts that need to be shared. Being a parent is the greatest blessing. Loved this Q+A! So excited to follow along with your journey! We did the NIPT testing, which is a blood test and can tell the baby’s gender at 12 weeks! Great post! Y’all are going to make great parents! I love that you’re going to keep your family life still private and limit that phone in front of her. I can’t wait to hear her name! Love this Q&A! So fun! Thanks for sharing! I would love to see a post about your pregnant beauty routine. My skin has been so crazy since I found out I was expecting! Also can’t wait to see photos of your baby shower! I respect what you do and I know all the decisions you make and will make for her good are going to be the best possible. I just secretly hope you will share her name after she is born. Thank you for taking me along in this journey. Congratulations! Will you be sharing a baby app that you are using, any books, or registry tips? Thanks!